English, Traditional Chinese(繁體中文), Simplified Chinese (簡體中文)and Japanese(日本語). You can change it from OPTION(遊戲設定). In AD 225, a long war was happened in China. The commander-in-chief of SHU kingdom named Kong Ming order the first general Zhao Yun to Battle with Nanman Barbarians. Falling stones, rolling logs, poisonous springs, attacks of malaria are everywhere in Nanman. The king of Nanman named Meng Huo is so stronger and crueler than everyone. Can you help Zhao Yun to finish his impossible mission? -This title is an Action RPG(arcade beatem up). -New boss characters just like Meng Huo, Lady Zhu Rong, Wu Tu Gu. -New armies: Elephant warrior, Cane armor-clad soldier, Fire witches, poisonous snakes & wildest beasts. -New riding system: you can ride the horse or elephant to fight to enemy. -New magic system: by collecting a fixed amount of flags, you can push the FLAG/MAGIC icon button to clear full-screen enemies. -New BAR system: when the green bar in the left up side fulled, you can push the FIRE icon button to launch a special powerful attack. Dragon of the Three Kingdoms (DOTK) is an Action RPG(arcade beatem up). It is very easy to play for anyone. 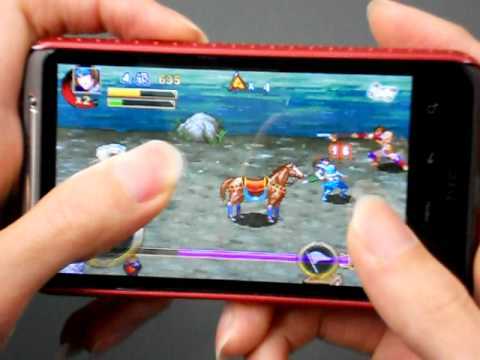 Use the touch control gamepad to move Zhao Yun, and push the SWORD icon button to fight with enemy or pick up items and flags. By collecting a fixed amount of flags, you can push the FLAG/MAGIC icon button to take a full-screen attack. When the green bar in the left up side fulled, you can push the FIRE icon button to launch a special powerful attack. Sometimes the FIRE icon button change into the HORSE icon button, it mean that you could ride the horse or elephant by your side immediately. When you are riding, you become more speedy and powerful. What's new? The green dragon serpent is coming! 2. Add to support 4 languages: English, Traditional Chinese, Simplified Chinese and Japanese. 3. Share the final score of stage 1 to FaceBook and you can get more 6,000 gold. 4. New version rearrange all of the old stages, and add a lot of new stages such as Into the Woods, Coiled Snake Valley, Serpent Fight. In this new version, there are huge forest, air road, tree house... and so on. 5. More new enemy bosses are coming, such as green dragon serpent, King Duosi, the governor of Tulong Cave... and so on.